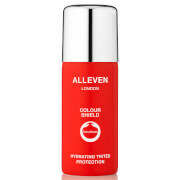 This ultra-fine mist controls shine for up to 16 hours. Skindinavia’s award-winning formula absorbs excess oil and keeps your makeup fresh and flawless, preventing makeup from sliding or caking. Recommended for oily or combination skin types. 85% of users prefer The Makeup Finishing Spray - Oil Control over powder. Patented Temperature Control Technology® helps prevent the appearance of shine. Proven to reduce the need for touch-ups or blotting. All Skindinavia products are paraben-free and hypoallergenic. For best results: Shake well. Apply over makeup. Spray 2-4 times in an "X" and "T" formation. Water (Aqua), Alcohol Denat, PVP, Aloe Barbadensis Leaf Extract, Polyhydroxystearic Acid, Ethylhexyl Isononanoate, Isononyl Isononanoate, Sodium Cocamidopropyl PG-Dimonium Chloride Phosphate, Dimethicone PEG-7 Phosphate, PPG-3 Benzyl Ether Myristate, Methyl Methacrylate Crosspolymer, Caprylyl Glycol, Glycereth-5 Lactate, Sodium Hydroxide, Fragrance (Parfum), Methyl Diisopropyl Propionamide, Poloxamer 407.